Happy 80th Birthday, Joyce Carol Oates! 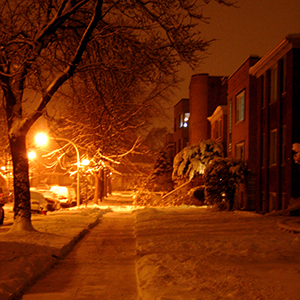 February in Chicago is icy, but the romance novels set here can warm the coldest night. From firefighters to FBI agents to vampires, it’s the city that “works” it! Our heroes are regular guys—with six-pack abs—and our heroines are smart and down to earth. Warm up with these titles; some are so steamy, you might need to open your window! Hell on Wheels: A motorcycle shop in the gritty Chicago streets hides a black-ops center. Black Knights Inc. is full of ex-Marines, spies and tough guys who get the job done. Ali Morgan needs their help when a crooked senator comes after her because she has evidence to expose him. Love your Entity: If Sierra Brennan wants to inherit her uncle’s house, she's got to spend 30 days there—with a ghost and a vampire! Written by Chicago-area author Cathie Linz with the same zing and humor as her contemporary novels. Falling for Autumn: When you’ve given up on romance, being the maid of honor at your sister’s wedding can be tough. Ajay, the best man, isn’t romantic either, but he still finds this independent woman irresistible. Sparking the Fire: Molly Cade is back in Chicago, trying to recover from a Hollywood scandal by working hard at her new movie. But when she shows up on set, she finds her former flame—now a Chicago firefighter—waiting for her in this installment of the Hot in Chicago series. Secrets of Sloane House: When her sister disappears right before the 1893 Columbian Exposition, Rosalind travels to Chicago and goes undercover as a housemaid to reveal the truth. A mix of history, romance, mystery and Christian fiction, this one is for fans of Dee Henderson. A Lot Like Love: Jordan Rhodes agrees to help the FBI take down a money launderer in exchange for help with her imprisoned brother. To Agent Nick McCall, the most important thing is to catch the bad guy by posing as Jordan’s date. As the case gets more dangerous, Nick realizes both his life and his heart are at risk. Match Me If You Can: When Annabelle inherits her aunt’s matchmaking business in Bucktown, she tries to bag a high-flying sports agent as her big client. But how do you find a wife for someone you’re falling in love with? Meanwhile, Portia Powers, the head of a rival agency, discovers her own match.